Today I am sharing a set of FREE ‘Happy Days’ journaling cards with you guys (for personal use only). I think I’ll use them to illustrate Lily’s 9Th B-Day! I want to thank you for always having beautiful freebies! I don’t find many out that that are as high quality as your designs. I use them for my weekly journals and they add lots of color and pizzaz! I truly enjoy your blog as well. 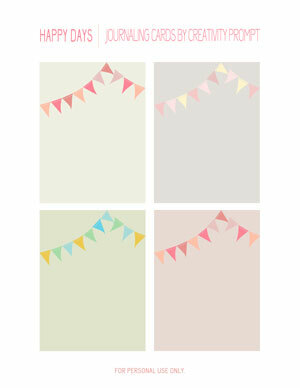 I think these journaling cards will look great on a scrapbooking birthday party page. Thanks so much. This is a lovely set, thank you. Love these!!! THanks so much!!! Thanks! I’m not sure how I’ll use them yet, but I’ve got them for when the inspiration strikes. LOVE these! I found your links on the Studio Calico forum and plan to use them for my Project Life album. I love banners so they’re perfect!! Thank you!